Pen-and-ink plan of Mr. Robertson's Mound at Masulipatam, intended to display the sculptures from Amaravati. 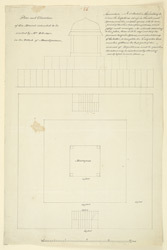 Inscribed on front in ink: 'Plan and Elevation of the Mound intended to be erected by Mr Robertson in the Pettah of Masulipatam'; also memorandum. The great Buddhist Stupa of Amaravati was one of the greatest architectural achievement of ancient India. The site is situated on the outskirts of the town of Amaravati near the ancient ruined city of Dharanikota. It was founded in the 3rd-2nd centuries BC and enlarged in the 1st-4th centuries AD under the Satavahana and Ikshvaku patronage. It was a centre of religious activities for hundreds of years and then fell to disrepair. By the mid-1790s the ruin of the Great Stupa has deteriorated into a mound of rubble with fragments of sculpture scattered about. In 1797 the British colonel Colin Mackenzie heard about the site and visited it. He was able to return again only in March 1816 and during his six months stay he made a series of drawings. In the meantime the stupa had been pillaged for stonework and the top of the mound had been dug by the local landlord to make a water tank. MacKenzie removed some stones from the site. Some were sent to Calcutta and others to the East India Company collection in London. He also transported some material to Masulipatam on the coast. This collection was later enlarged in 1830 by Mr. Robertson, a collector of Masulipatam of whom nothing is known. By 1853 it numbered thirty-three stones which were used to decorate a new market-place which was named after him.